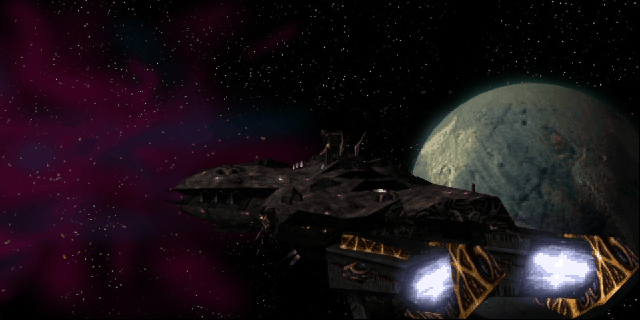 A three-mission minicampaign set during the height of the Battle of Deneb in 2335. As a Vasudan pilot assigned to the PVD Guardian, you must defend your systems against the Shivan advance at any cost. This campaign was the grand prize for the Phoenix alternate reality game to promote ST:R, and has story tie-ins with Phoenix, ST:R, Shrouding the Light, FS1, and FS2. It also includes a short story fanfic. You can also use the FSO Installer or download manually. Requires FSPort 3.1 or later and SCP 3.7.4 or later. I tried it but when I started the first mission (I was using FSO 3.8) I didn't have any primaries or secondaries. There was also no primaries or secondaries in the weapon select screen to put in my ship. Any suggestions? Sweet little vignette of a campaign. Like ST:R, this has high-quality classic FreeSpace game play. Check the mod.ini to be sure it's pointing to the version of the FSPort that you have installed. I actually tried that too. Both mod listings (Deneb III's original, and a copy of ST:R) came up with no primaries and secondaries for me. Doesn't the latest version of the port come in a folder called "fsport3_5" not "fsport"? If that's not what's getting you, I'm sure it'll get somebody (it got me initially) so posting it won't be a waste. The first step is always to post your fs2_open.log file. Doesn't the latest version of the port come in a folder called "fsport3_5" not "fsport"? The zip is called fsport3_5.7z, but it, like previous releases, is supposed to be extracted into the "fsport" folder. The Installer is configured that way, but if you did it manually, you may have extracted it to a folder of the same name as the 7z file. I don't know what I did differently, but I just redownloaded Deneb III and it works this time. Thanks for a great campaign Goober5000. Glad to hear it! You're welcome. I ran into a problem on the third and final mission. The dialogue said the Eva was jumping out, but it didn't even move (and it's engine subsystem was intact). Here's a log if it helps. Thanks. I suspect its nav subsystem was destroyed; Deneb III has that AI Profiles option set and I forgot to subsys-guardian it for the Eva. I've uploaded a fixed version. I just checked the Installed and it said Deneb III was up to date, should I download the link in the thread? I hadn't updated the Installer version number. I just did; try again. I felt the final mission was very engaging and drew you in. Even though plotwise we knew what was going to happen, the mission felt compelling in that I was really pulling for the Ursas and was hoping to change FS history. So you did a great job with that one. Dropping by to say thanks to Goober for finally putting this together. It's been anticipated for a long time. For anyone who prefers the MediaVPs, I've put together a small package that includes a modified mod.ini, updated maps (and glowmaps) for the retail Orion model, and high-res Aten maps for the PVT Qeb. (I will upgrade that someday, I have the concept art sitting right here...) Download the ZIP at this link. Goob, you may want to fold this into your download package. Missions 1 and 2 were a great warmup and I think Mission 3 was executed beautifully! Thanks so much for the checkpoints. Unfortunately I couldn't beat it without cheats. Those Nephilims broke the Guardian's legs, stabbed it to death, and then shot it in the head for good measure. Checkpoint 4 left it at 53%. Being unwilling to play through the whole mission again to change armament and reassign wingmen wasn't an option with my schedule (I *just now* got to play it, on Easy no less) so I ~I'd the Typhon at 1%. It still had to sit there taking a lot of hits before it jumped out--and to my horror the Lucifer's beams landed a glancing blow instead of a near miss. I would really appreciate some checks at this last phase to tone down the difficulty based on the challenge that lies ahead for the player. The beam impact on the Legion was flawless! Seriously, congrats on pulling that off. Particle effects were beautiful, the model swap was seamless, the drift was really smooth. Also, regarding the aforementioned glowmaps: Can you add an event to turn off or better yet, flicker glowmaps on the Legion once it's been hulked? It would help with the atmosphere. All in all it's the Battle of Deneb we've all been waiting for and I can't imagine any better way to execute it. Except maybe have a trio of Anubis fighters arrive near the end, since they're so far away at the start of the cutscene. You should be proud of this, thanks for sharing. Thanks, I'm delighted to finally publish it. Awesome. I've added these to the campaign. Glad to do so. It helped during development as well; I couldn't imagine FREDding this without checkpoints. That's one of the reasons I put it off for so long. Having tested this with the checkpoints you sent me, I entirely agree. I've made some adjustments to the difficulty. Thanks! I actually had to learn scripting and hack one of the mediaVP scripts to do the effects the way I wanted. Good idea; I've added your suggestion to the mission. The download has been updated. There is actually a wing of Anubis fighters present: Sigma. I thought about having them start from way off (possibly from a different ship) but couldn't think of a way to do that plausibly. I would like to echo again the sentiments Galemp said, it's a great campaign to flesh out the FS1 era. I get that they would want the ship to be destroyed, but if they see it glassing worlds, wouldn't some of the Ursas have been devoted to destroying the beams of the Lucifer? Thanks. The latest update, version 1.1, has some additional fixes and enhancements. By that point Deneb III had been written off, so there was no immediate need to destroy the turrets. (They obviously didn't think it would deviate from attacking the planet, or they wouldn't have parked the Legion right next to it.) If the Lucifer was destroyed, the state of the turrets wouldn't matter; whereas if they didn't manage to destroy it and it escaped, it would be able to repair its turrets and those Harbingers would have been wasted.